We've had some variation of the Manhattan-is-losing-its-edge conversation hundreds of times over the past 10 years and you probably have, too. Yes, Manhattan is now a nicer place to live, if you like that sort of thing. But there was something to be said for a city where 'watchyerback, watchyerback' was not only the frequent warning shouted by anyone with a hand cart and a healthy dose of road rage, but also essential advice on making it through your job, the streets, any given day. So the arrival of Judith Stonehill's new book, New York's Unique & Unexpected Places, brought us an unexpected amount of pleasure. Its selection of 50 places in the five boroughs reminded us that we haven't completely lost our eccentric shops, our hidden corners, and moments of grace. Ms. Stonehill, who was one of the forces behind the late, lamented New York Bound Bookshop, has written authoritative accounts of the included museums, markets, and gardens. The accompanying photographs by Alexandra Stonehill are superb, there's a good intro by Ethan Hawke about the city's evolution, and the book's design, by Willy Wong, is a beaut. Something completely different, yet it too contains 50 selections (in this case, recipes), it too brings an unexpected amount of pleasure, and again reminds us that as long as there are people like Zora O'Neill and Tamara Reynolds in New York, we'll never be a dull city. The two authors have been running Sunday Night Dinners, an informal supper club in Astoria, since 2003. You can read how it all got started in the book's introduction here (PDF). 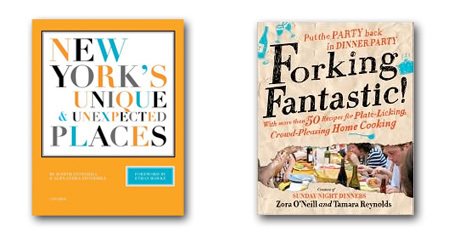 Now they've put their considerable Perle Mesta skills into a book called Forking Fantastic!, giving even the most hopeless hosts a chance for dinner party greatness – or at least a delicious, boozy good time among friends. And these days, that's really quite a gift. You can meet the authors at a book signing/potluck dinner at Word Brooklyn on October 11th. Details are here.